THOMAS DEKKER » Blog Archive » Happy 24th Birthday! 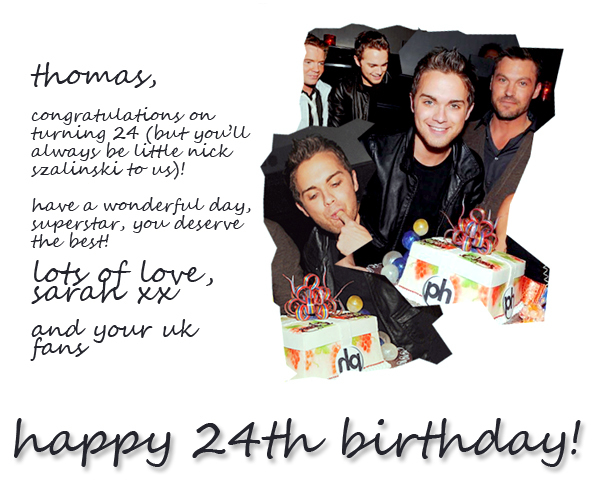 It’s Thomas Dekker’s 24th Birthday, today, December 28th and I’d like to wish him a very special day! Thomas, you are one of the sweetest, sincerest and most thoughtful people I’ve ever had the pleasure of meeting and you frequently brighten my day, usually when I need it most (are you psychic?). Have an amazing day! PS. FANS – Don’t forget to tweet him @theThomasDekker to let him know you care! And there’s still time to support the Alzheimers campaign for a chance of winning a special prize handpicked by Thomas himself!